Above: In the late 1920s and early 1930s groups unemployed men from Brynmawr would congregate near Market Square and elsewhere to help pass the time. This photo is of Beaufort Street with the New Griffin Hotel to the right. "The Brynmawr Experiment" was an attempt in the late 1920s to revive the town's severe economic depression and accompanying mass unemployment. As a community built on the fortunes of heavy industry, it was natural that Brynmawr would suffer as the fortunes of those industries declined. And suffer it did. To understand the economic decline experienced by Brynmawr and by south Wales as a whole, it is perhaps useful to briefly mention how the town developed and prospered during the preceding century. It should be mentioned that the short essay that follows is intended only as a summary of The Brynmawr Experiment, and I am well aware that other treatments go into far greater detail. In the 19th century, the town of Brynmawr grew and prospered alongside the region's iron and coal industries, which, at their peak, employed thousands of local men. 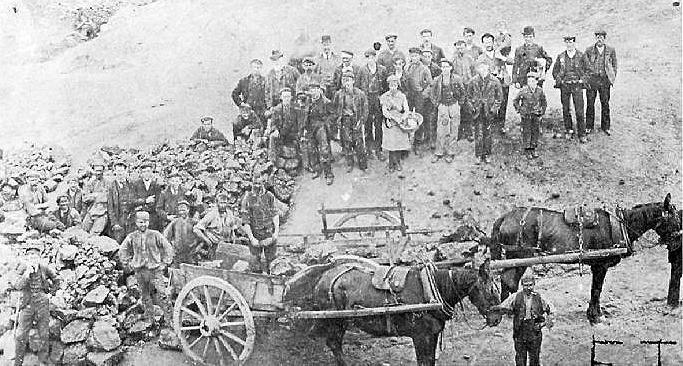 Until the last quarter of the 19th century, workers flocked to Brynmawr in search of employment in the local iron works at Nantyglo, Clydach and Beaufort, or in the mines (coal and iron) which supported these operations. Despite short-term economic declines, worker unrest and two deadly cholera epidemics that killed thousands in the late 1840s, Brynmawr remained an attractive alternative for those seeking industrial employment through the middle of the century, as evidenced by steadily increasing population numbers. Historian Hilda Jennings notes that as a dormitory town for the iron works at nearby Nantyglo, Brynmawr escaped the dreary worker-block housing characteristic of many other industrial communities. This allowed for local merchants to prosper, which in turn helped free workers from the company run shops - the dreaded "truck system". Below: Rare 1851 photograph of iron workers employed in the mining of ironstone in Nantyglo. "Difficulties with regard to the quality and cost of extraction of local ores, together with the gradual superseding of iron by steel, led to a decline in the iron trade which culminated in the closing down of the Clydach and Beaufort Iron Works in 1861, and the sale of the Nantyglo Iron Works by the Baileys in 1870, followed by the end of their activities shortly afterwards. The neighbouring works at Ebbw Vale and Blaenavon were converted into steel works." "After the Clydach Iron Works were closed down in 1861, the distress of the population, congregated in the district almost entirely owing to the local demand for labour, was very great and was reflected in the increase of persons receiving Poor Law Relief between 1861 and 1871, and in the sudden decrease in population due to migration." The closing of the ironworks caused a significant flight from Brynmawr and the surrounding region, as many of the area's workers left to seek work in the coal mines and collieries in the nearby Rhondda. For the first time in decades, Brynmawr experienced a population decrease accompanied by an increase in vacant housing. There was a brief revival in the region's coal mining fortunes in the early 20th century, however, with the end of World War I, by the early 1920s, economic depression and unemployment in Brynmawr soon reached unprecedented levels. 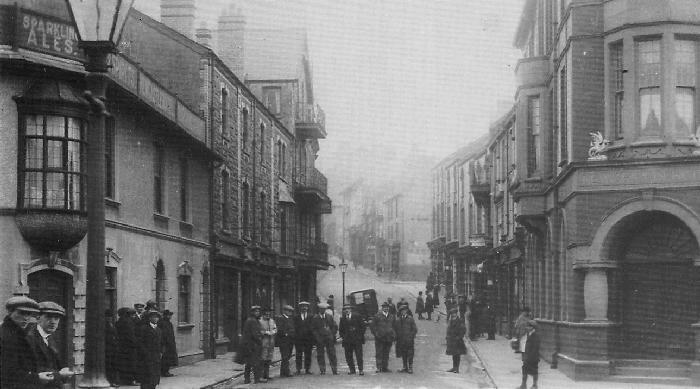 The town's chronic unemployment problem in the 1920s is evidenced by several photographs from the era showing large groups of unemployed men gathered around Market Square and elsewhere in the town (above). Some were simply passing the time, while others gathered, clinging to the hope that a passer by might offer a day's work in return for wages or food. Hunger became a problem, as mothers went without food in order to feed their children, and idle men often spent what precious money they had at the cinema or in the local public houses. Although the Town Distress Committee attempted to aid families of the unemployed, by 1928 their resources had almost run out. Below: Unemployed workers from Brynmawr doing voluntary work organized by the Quakers. Against this bleak economic backdrop, members of the Society of Friends (the Quakers), attempted to revive the town's fortunes by overseeing relief funds coming into the town, and attempting to set up new light industries to help relieve unemployment and promote employment diversity - the so-called Brynmawr Experiment. Men were pulled from the ranks of the unemployed to help repair roads and to build a new community swimming pool on the site of a former iron works pond. With little initial money, some of the work was voluntary while other men were paid by being provided a meal. Below: Brynmawr Bootmakers was one of the successes of The Brynmawr Experiment. In 1929 a small boot making group was set up and began supplying boots to the Mansion House Fund. This group later evolved into Brynmawr Bootmakers. Ltd., and enjoyed success throughout the 1930s and into World War II. In 1930 the Brynmawr and Clydach Valley Industries Ltd. was formed as an umbrella group to help create and manage local industries, and provide work for unemployed miners in the new industries and in agriculture. In order to fund the group an appeal was made and stock was issued in hopes of raising �,000, and by July of 1832, some �,000 towards that goal had been collected. Capital for new companies was raised by issuing shares to the workers in the form of loans from the umbrella group, and after the company showed a profit, the idea was that the loan would be repaid and outside control of the company would be relinquished. In this scenario, control of the company was returned to the shareholders, the workers themselves. As shareholders then, workers also had a personal interest in the success of the company. For most this was a new concept and a far cry from working for faceless ironmasters. 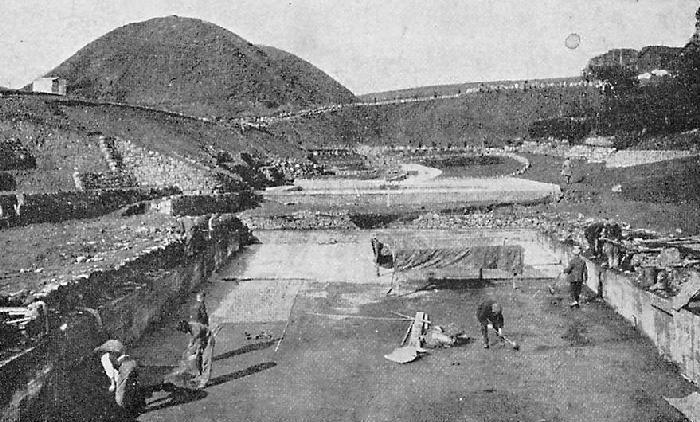 Below: The Brynmawr community swimming pool under construction in the 1930s. 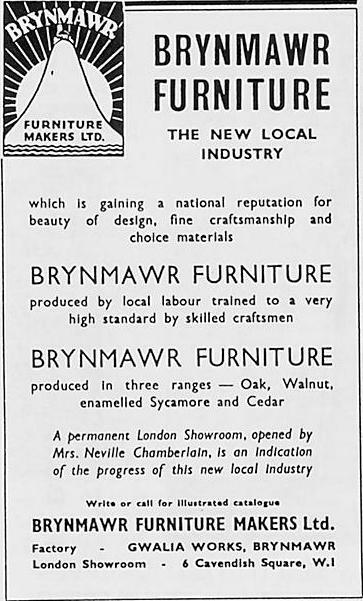 Perhaps the best-known industry set up during the years of the Brynmawr Experiment was a furniture making group, which sought to train the town's youth in high-end furniture making. Although at first the company operated under primitive working conditions, before long they began turning out a high quality product. The style of the furniture was in keeping with modern trends, and orders were taken mostly from private sources. In time "Brynmawr furniture" gained a respectable degree of popularity outside the local area, and today a fine specimen of this furniture, (now highly prized by collectors), can be seen in the Brynmawr and District Museum (below). 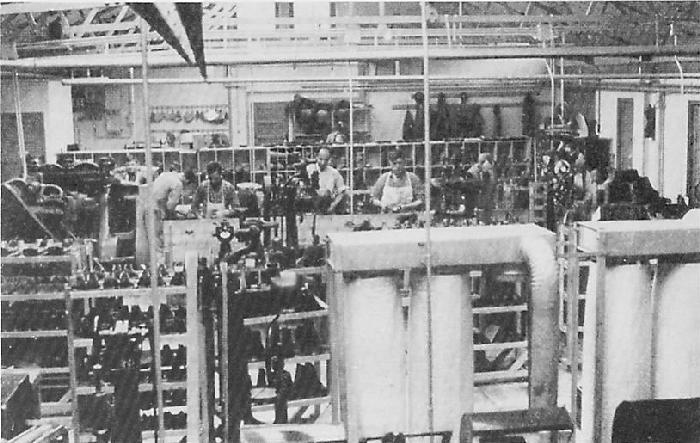 When World War II broke out in 1939, many of the men of Brynmawr went to work in the munitions industry, and this drain of manpower combined with wartime rationing basically put an end to the Brynmawr Experiment. Although boot making continued (boots were needed for the war effort), the furniture business shut down as the demand for high-end furniture all but disappeared. 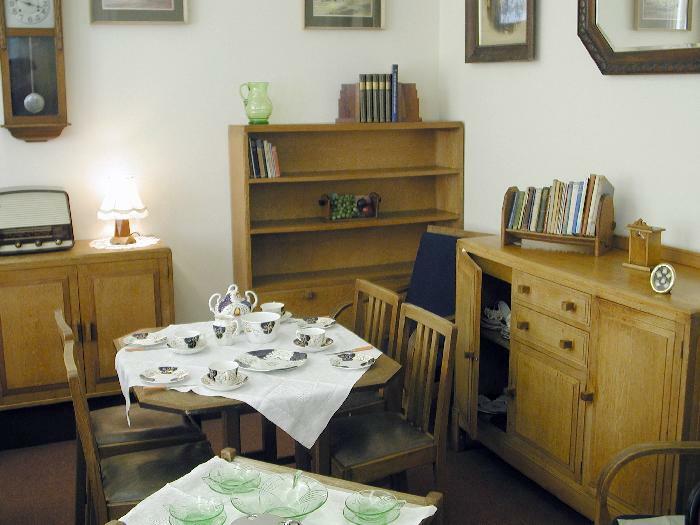 Below: An example of Brynmawr furniture on display at the Brynmawr and District Museum. 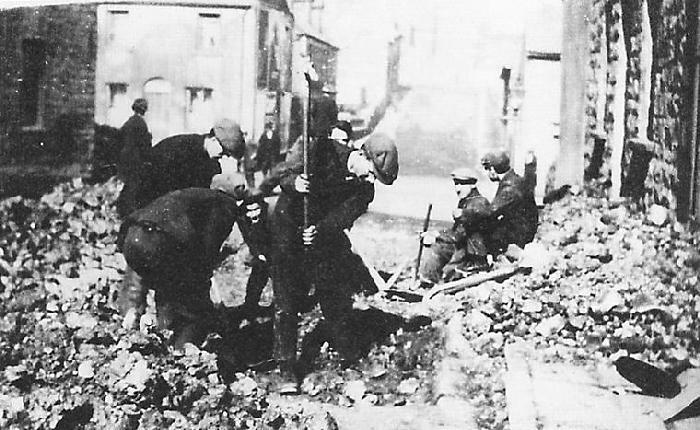 Although not entirely successful, the Brynmawr Experiment succeeded in educating people about the need to train in other industries, and not rely so heavily on coal mining for employment. The program provided not only an economic boost to the town at a time of desperate need, it also provided an equally important psychological boost to a community long battered by unemployment and poverty. In other words, some would argue that the greatest legacy of the Brynmawr Experiment was not that it put people back to work, but rather that it caused individuals and the community to realize that their problems could be solved by looking inward. Although Brynmawr would continue to supply workers to the coal industry, the Brynmawr Experiment demonstrated to the community that there were other alternatives to simply waiting for the mines to reopen. This spirit of community self-sufficiency remains strong today, and is one of the primary reasons Brynmawr has managed to survive other economic hardships in the post-World War II era. Brynmawr: A Study of a Distressed Area, Hilda Jennings, Allenson & Co., London, 1934. Idle Hands: The Experience of Unemployment, 1790-1990, John Burnett, Routledge, 1994. Utopian England: Community Experiments 1900-1945, Dennis Hardy, Brunner-Routledge, 2000.